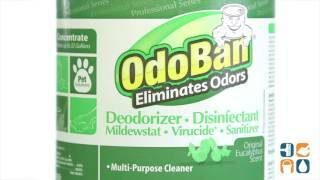 OdoBan eliminates unpleasant odors on washable surfaces such as upholstery, carpets, bedding, showers, walls and floors while leaving a fresh scent. 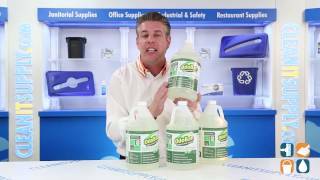 OdoBan Odor Eliminator Disinfectant cleans, disinfects, sanitizes and deodorizes all hard, nonporous household surfaces. Leaving no residue, this concentrated multipurpose cleaner eliminates 99.99% of germs including Strep, E.coli, Staph, Listeria monocytogenes, HIV-1, Influenza A/Hong Kong and Herpes Simplex type 2 and Klebsiella pneumoniae on hard, nonporous, nonfood contact surfaces in 60 seconds. It can be used as an air freshener, laundry freshener, mopping solution, pet odor eliminator and spot treatment. Easily eliminates foul odors caused by pets, mildew, smoke, vomit, sewage and urine. As a disinfectant OdoBan is a fungicidal agent against germs such as Trichophyton mentagrophyte (the athlete's foot fungus), when used on surfaces in areas such as locker rooms, dressing rooms, shower and bath areas and exercise facilities. It also effectively controls and inhibits the growth of mold and mildew.